Welcome to Found Off The Street, our look at cars found on the cape that rust liked so much it decided to summer there; Cape Cod, MA. Today we have a 1970 International Scout 800A. Last week's 1973 Volvo P 1800ES got some Jalop love even though (or perhaps because) it was a little rusty and needed some love. 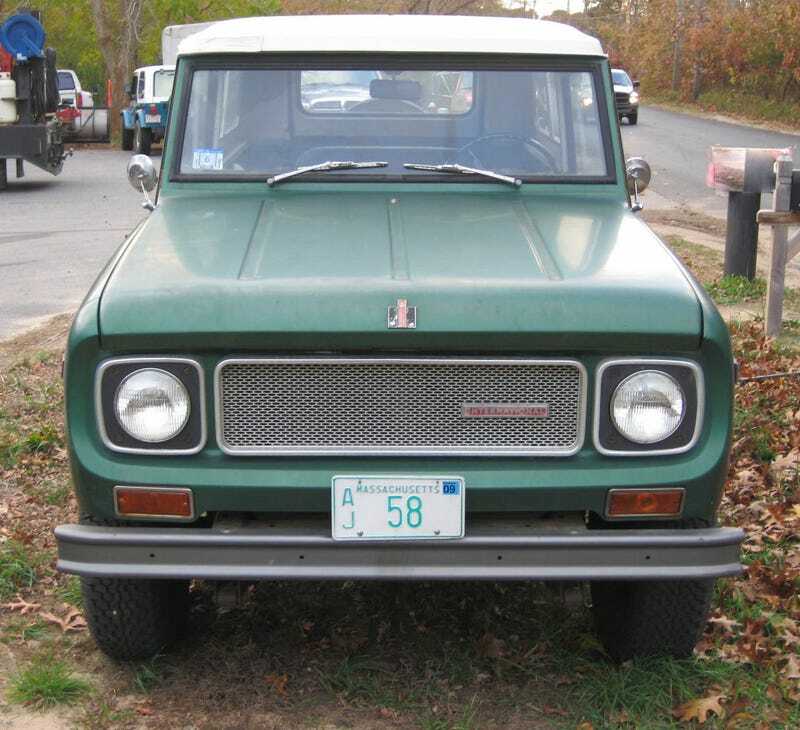 This week's FOTS is something even more rare than the one of 8,077 Volvo 1800ES; a rust free International Scout in the Northeast. Defying the IH logo on its hood and the 70s era Massachusetts license plate, this original 1970 Scout 800A has avoided the rot that usually comes with these two badges of honor. Unlike the pair of Scout IIs we saw a couple weeks ago in FOTS this week's 1970 International Scout 800A is from the first generation of Scouts. Although this 800A was close to the end of the first generation Scout's 10 year production run, the 1971 800B was actually the last model of the "Small Scouts" produced. The first Scout 80 was available in late 1960 for the 1961 model year. In 10 short years, the Scout earned itself a reputation as a hard working, go anywhere vehicle in stock form which contributed to the popularity of the Scout IIs. The first Scout available was the 80 model, available from 1960 until 1965. The 80 was available with one engine/transmission combination: the 152 4 cylinder combined with a non synchromesh manual 3 speed. Towards the end of the model's run a turbo option was offered on the 80, which hopefully raised the 80's maximum downhill speed from 55 MPH. Scout 80's are the only Scouts to be offered with a fold down windshield, setting them apart from later 800/800A/800B models. In late 1965 the 800 model was introduced, answering the complaints of many loyal scout owners. Although they looked almost identical to the casual observer, the 800 featured a variety of improvements over the 80. For the first time a V8 and a 4 speed transmission was available in the Scout, along with a rather pathetic excuse for a dashboard, upgraded front and rear ends and other minor improvements. The 800 was produced until 1968 until it was replaced by the slightly changed 800A. The 800A's front end was slightly redesigned, and along with some added creature comforts featured only minor mechanical improvements. Built in 1969 and 1970 the 800A was replaced by the 800B for 1971. The 800B was produced for only part of 1971 before the Scout II was introduced to replace the small Scout body style. Known for their tendency to rust almost as much as their off road prowess, significantly less small Scouts survived than the Scout IIs they were replaced by. Many were used as work vehicles until they rusted into the ground, making any small Scout, let alone a rust free original like this week's FOTS truck, a rare sight. As many of you have probably realized by now, I love International Scouts. Although the orange FOTS Scout II initially inspired my love of Scouts, it has always been the smaller body style Scouts I have favored. I had a 1964 Scout 80 and a 1966 Scout 800 before purchasing my current beloved 1967 Scout. As you might imagine, several months ago, when I first caught a glimpse of this 800A in a remote storage area close to home, I was intrigued. Initially there was no indication of the unbelievable original condition of the Scout. It was close enough to the road to be spotted, but far enough away in a secure area that inspection was out of the question. All spring and summer I drove by the Scout once a week to see if it had magically appeared at the side of the road. It didn't, until one day I was driving nowhere near where I originally spotted the Scout and there it was. What&apos;s the Most Fun Car (or Truck) You Can Buy for $5000? Upon initial inspection it was easy to see the unbelievable original condition of the Scout inside and out. Somehow, despite the fact it was a Scout in New England, it had managed to stay very original and very rust free. Sitting by the side of the road the Scout looked like it had just rolled out of the early 70s. A quick inquiry to the owner of the business the Scout now sat in front of revealed that the IH was not for sale and I was only one of many who wanted to know about it. The Scout had changed hands in the time I was watching it, and the new owner was figuring out what to do with it. Although it remained outside until right before the first snow flew on the cape rust remembered, one snowy day I drove by to see the Scout was gone again. I can only hope the Scout is safely out of the weather with plans of preservation and enjoyment. Surely the cape that rust remembered hasn't seen a Scout so rust free and original for several decades, and may never see another.